Nacel's student exchange programs in Brazil offer the unique opportunity to live with a local family and study at a local high school. Like just another Brazilian teenager! If you have an intermediate level of Portuguese and want to improve it as much as you can, come and participate in this program. Live an unforgettable experience and discover the educational system of South America's largest country. What should I expect from this High school exchange in Brazil? The student can study one semester or one academic year at one High school located in Greater São Paulo, Brazil. Students will live with Brazilian host families who will welcome them as if they were a new member of the family. 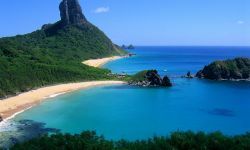 To make it easier for you to adapt to Brazil, you will benefit from a three-month Portuguese course. As soon as you arrive in the country, you will attend an orientation session from a local coordinator who will provide you with assistance and support throughout your stay. We will keep your parents informed of your adventures in the country. Although, graduating from a high school in Brazil is not possible, you can still participate in this experience. 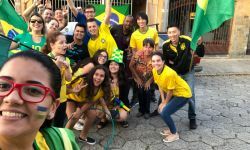 International students from all over the world study in Brazil to immerse themselves in the lifestyle of Brazilians and to get their world-famous accent! 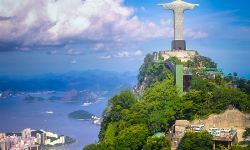 Sign up for this authentic exchange program in Brazil with Nacel! Please request more information through the contact form. Saying good bye to my parents was difficult; I mean I was not going to see them in a long time and I kept wondering how was it going to be to get up in another house and say “good morning” to a family that wasn’t my family. That really scared me a lot. When I cross the gate of the plane, I looked into myself and notice that I was going to experience a huge change. 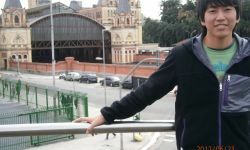 I was not going to be a teenager anymore that relies on his parent´s to get everything that I need and also most importantly, I realized that I needed to start to make my own life. When I arrived to Brazil something strange happened. I was no longer afraid, it was like something changed in me and made me feel that everything was going to be fine. When I first met my Brazilian father I knew that this experience was going to be incredible and when I met my Brazilian mother I felt happy and secure. Suddenly I felt that a needed to know this lovely country from the top to the bottom and did my thing. Brazil it’s a country full of contradictions, on one hand it’s a growing economy with a first class growing economy and population; on the other hand they have also people that lives in extreme poverty. That reminded me of Mexico a lot, and also made me thought, what it´s going wrong in the world? I mean, how aren’t people realizing what it´s going on? They live like they’re in a bubble that cover´s them from the reality that their living? I got very angry with myself, because I had to go to another country to realized that Mexico it´s in a very bad situation too. I guess that the big difference about Brazil and Mexico it´s that Brazil wants to make a change and the ones that are searching for it are the young ones. I saw how the teenager´s wanted the best for their future and how they were searching for ways to improve the economy, health and most importantly the education. They are doing it and Brazil it´s changing because of them. I really didn’t know why I chose Brazil to make my academic exchange, but something inside me told me that Brazil had a lot to show me and teach me. My feeling weren’t wrong at all. Now I have tons of new ideas and a new sense of change and I don’t know how, but I would like to share these with my family, friends and the entire world. So now I know why I chose Brazil, and I couldn’t be happier with my choice. 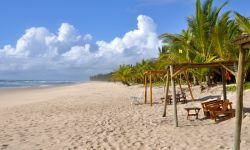 I really would have loved to stay a little bit more and without a doubt I would love to go back, mainly to visit my Brazilian family and also my new friends that I really love and also consider them part of my family and why not to dance a little bit of samba.